Join us at Corniche for a mouthwatering selection of French, Arabic and international dishes. 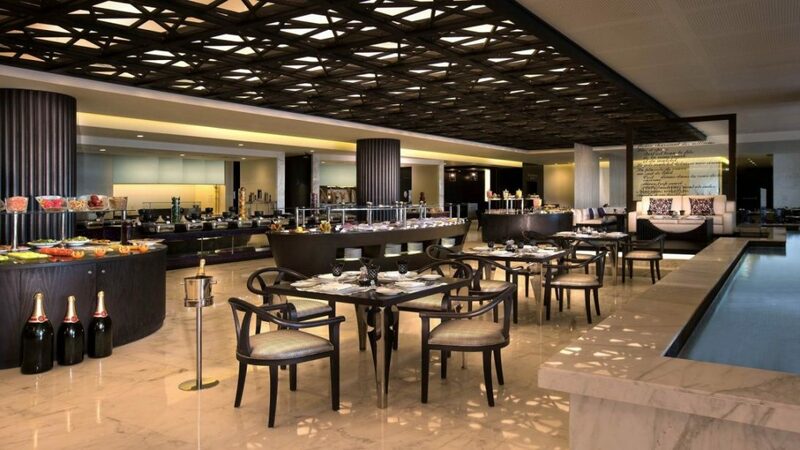 Open all day, the restaurant features an ever-evolving buffet, three live cooking stations and a bakery. The décor blends French industrial design and Arabesque carvings. A fountain gently bubbles in the background as you watch the talented chefs at work in the open kitchen. The aroma of freshly baked bread awakens your senses, and the sight of delicious pastries and sweet treats makes you eager for dessert. For an early breakfast or a late dinner, Corniche welcomes you whenever your appetite calls. For the past 16 years, I’ve been fine-tuning my culinary skills at luxury hotels around the world, from Dubai to Switzerland and across Asia-Pacific. This year marks my fifth year with Sofitel Abu Dhabi Corniche. My cooking style has been influenced by the many great chefs I’ve had the honor of working with over the years, yet I remain true to my fairly classical roots. I believe in keeping food simple, and letting bold, punchy flavors shine through. When seeking inspiration, I look to new ingredients and market trends. My style and technique have developed with time. Since working with AccorHotels, there’s definitely been an increased emphasis on sustainability and responsible farming. It’s easy to reduce one’s carbon footprint when there are so many wonderful locally sourced products. A lot of passion and creativity go into transforming raw ingredients into flavorful dishes that make our guests smile. I find my job very rewarding.